Dimensions: Total length approximately 26 cms (roughly 10 inches). 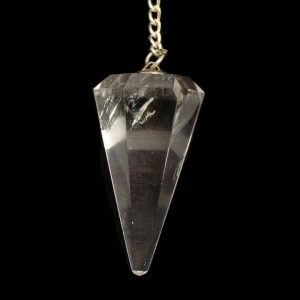 The pendulum crystal is made from Clear Quartz and comes in a box with a satin-like material inside. Each crystal bead represents a chakra which can be found labeled on the box. Brazilian or Indian pendulums? This pendulum is made in Brazil. We used to buy clear quartz crystal pendulums from India. But we have found over time that the Brazilian made pendulums are just better made and with usually a better quality of crystal. So even though we can buy much cheaper in India we have now elected to buy our clear quartz crystal pendulums from Brazil. We hope you agree. Dimensions: Total length approximately 26 cms (roughly 10 inches). 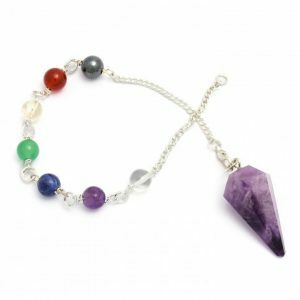 The pendulum crystal is made from Amethyst and comes in a box with a satin-like material inside. Each crystal bead represents a chakra which can be found labeled on the box. 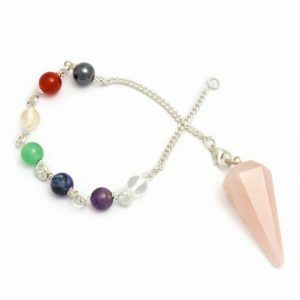 Please note the colour will vary between pendulums as they are a natural product. Dimensions: Total length approximately 26 cms (roughly 10 inches). 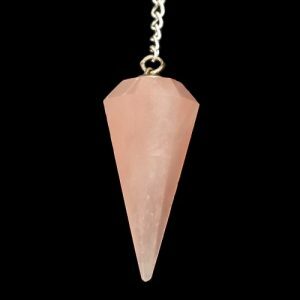 The pendulum crystal is made from Rose Quartz and comes in a box with a satin-like material inside. 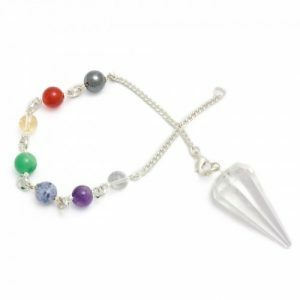 Each crystal bead represents a chakra which can be found labeled on the box.